Can you activate multiple sacrifice abilities using specific and target creature sacrifice abilities? Sacrifice a creature: Phyrexian Ghoul gets +2/+2 until end of turn. MediSyntax I've been playtesting this many times over and have found there to be some great lines of play (even without including lion's eye diamond) - the deck could even be made to fit a reasonably low budget! 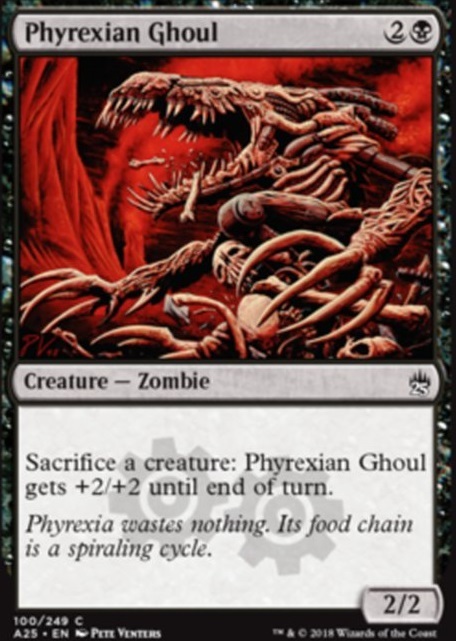 With regard to Carrion Feeder - often I feel like the deck needs another sacrifice outlet & I don't have the tutor capacity to get Phyrexian Altar , play it & win in one turn, but carrion feeder is wonderful - so I may take up that idea of using Phyrexian Ghoul for added consistency. 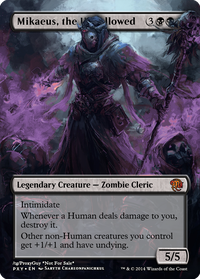 Furthermore - after a week of testing: Liliana, Untouched By Death does enable some comboing wins with zombies other than Gravecrawler ... but I feel like casting GC from the yard is not actually the issue. I believe that the resilience of Bridge from Below is ok at best - the fact that any other deck running a sacrifice outlet, or even Flash can stop the entire combo by removing it is very risky. Conversely - the ability to do the same by using Diregraf Colossus adds greatly to the consistency & backup plan for the deck (plus - this will 99% of the time enter with +1 to block tymna). I've found the swings with Mindslicer to be absurd - as the game immediately becomes topdeck for 3+ turns. However at the 4 mana slot - I'd consider running Imperial Seal sooner, or Grim Tutor (as a lot of the time I find that I -NEED- the cards on time). Lastly, I've been testing out Thornbite Staff as a combo option with Soldevi Adnate / Priest of Forgotten Gods - it's very mana intensive, but with priest & the usual GC & bridge setup it's a win, while also drawing you cards. This is... ok. Not great - but not awful. It's more than likely that I'd cut the Thornbite Staff for another ritual of some form / a tutor / artifact ramp, as the mana in here feels like it could use either a Mox Diamond / a little more. Further testing to follow - let me know your thoughts. 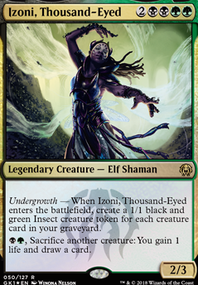 I have been having such excellent results from Carrion Feeder as a free sacrifice outlet/zombie for Gravecrawler loops that I am considering adding Nantuko Husk as a backup plan (or Phyrexian Ghoul , if insects offend you). Endrek Sahr, Master Breeder and Krenko, Mob Boss are some good token generators. You could really do your mana curve a favor and probably go with early goblin drops to support the Krenko rout. Ghoulcaller Gisa is pretty solid, and for lots of fun, equip her with Thornbite Staff. That can make a lot of tokens you can then sacrifice for fun stuff. Kher Keep is a solid land to include. Even cards like Myr Battlesphere and Pentavus can provide you with sac outlets. Hangarback Walker is another solid option. Blue has options like Thopter Spy Network and Efficient Construction for generating tokens. So, with your commander, what you care about is creatures getting sacrificed. Not dying, but sacrificed specifically. So, the best way to help yourself out is to not rely on your opponents to provide the sac fodder. For that, you need more sac outlets of your own. Cards like Carrion Feeder, Yahenni, Undying Partisan, Viscera Seer, Phyrexian Ghoul and Nantuko Husk are all free sac outlets that you let you start putting counters on your commander really quick. Red offers Goblin Bombardment, which could be switched out with Vicious Shadows. Archfiend of Depravity would fit your theme well, too, along with the Eldrazi you have with the Annihiliator mechanic, but you don't need too many of them. Running three or four of them is probably sufficient. 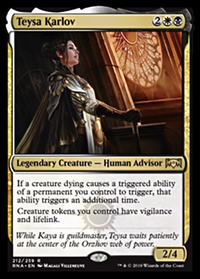 You want to protect your commander, so add cards like Swiftfoot Boots, Lightning Greaves, and a budget option no one ever thinks about, Diplomatic Immunity. Distended Mindbender could probably go. I fail to see how it fits what you want it to do with your Commander. Patron of the Moon doesn't look like it fits, and neither does Dreamscape Artist. I'd cut Sire of Stagnation as well. Blight Herder probably isn't great, either. Jin-Gitaxias, Core Augur is a good card, and good for card draw, but if you're opponents aren't playing creatures, they can't sacrifice them, and it just might make you a big fat target. I'd ditch Lotus Bloom for something more like Worn Powerstone or even a Mind Stone. I hope these suggestions help. Thraximundar looks like a fun commander to run. I hope these suggestions help you to focus the deck more, and make it run more smoothly. Let me know what you think. I agree about running Ashnod's Altar. Its just a good card all-around, and the number of sac outlets you have is concerning, at least to me. You mentioned earlier that you have "too many sac outlets," but that really isn't the case; you have four: Jarad, Golgari Lich Lord, Viscera Seer, and the Nantuko Husk and Phyrexian Ghoul that you added. 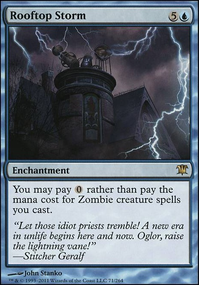 The rest of the cards you list in your "Sacrifice" list aren't sac outlets, per se; they are cards that offer edict effects, which are good, but aren't sac outlets in and of themselves. There is a difference. That doesn't mean they aren't good, useful cards, because they are. But they aren't a sac outlet. They say the best things in life are free, and free sac outlets are the best kind. The altars, Ashnod's Altar and Phyrexian Altar are the best, hands down, for Meren. They provide early ramp, allowing you to get Meren out ahead of time, and once she hits the board, its easy to stack up two or three counters per turn with them. That is, if you have enough early drop creatures to sac to them. Free-sac-on-a-stick is the next best thing, cards like the Ghoul and Husk that you added, and cards like Carrion Feeder, Phyrexian Plaguelord (which doubles as removal), and Yahenni, Undying Partisan offer great options as well. You could even consider running Altar of Dementia as another option, which you can use to mill yourself or your opponents, which is probably better than Deadbridge Chant, but running both would be ok. Jarad is a nice sac outlet, too, but he's better in the mid to late game, as he isn't a free sac outlet. Having a good package of sac outlets allows you to make sure you have consistency in the early game. In my Meren deck, I run 15 one-drops, 12 two-drops, and 16 three-drops, and mainly finishes through combo. That mana curve allows the deck to take off fast, and stay consistent. I'm sure I've got some changes I need to make to it, but by and large, the deck runs well, and is easily my best, most consistent deck, because of the low mana curve. Early on, I think a lot of people played Commander thinking the mana curve didn't really matter. As time has gone on, that has proven to not be the case. At any rate, I don't want it to sound like I'm just trying to cut down your deck; I'm not. I like Meren builds, and there are always fun and different ways of doing things. You just want to be sure that if you take you deck out into the wild, it will hold its own in an environment you've never played in before. bushido_man96 Thanks for the suggestions. Ashnods alter and Phyrexian Altar were both cards I considered putting into the deck, but discarded them because I wanted to run more creature that synergized with Meren's recursion ability. When playing this deck though I have noticed that I want more permanent Sac outlets like Viscera Seer. I ran Fleshbag Marauder and Merciless Executioner because I could sacrifice them with their ETB effect and force opponents to sacrifice a creature but it is a one time deal until I can recur them. I do like Phyrexian Plaguelord and the fact he can help with removal but I don't think he will fit in as well because of the higher CMC. I will try to work out ways to include Nantuko Husk and Phyrexian Ghoul though because at 3 CMC being able to recur them is easier if I need to and can help me start sacrificing creatures sooner. Thanks again for comment! I love recursion builds, and I am especially fond of Meren. I think you might need some more sac outlets to really make sure things run smoothly. Ashnod's Altar is nearly a staple in a Meren deck, and you'll have no shortage of fodder for it. Tapping a Llanowar Elves and then sacrificing it for 2 more mana has its advantages, and then you get the Elf back at the end of the turn with Meren out. 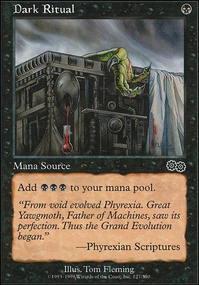 Phyrexian Altar is also great, if you can afford to get one. Other good sac outlets include Nantuko Husk and Phyrexian Ghoul. Phyrexian Plaguelord can turn into a removal nightmare. The more free sac outlets you can have to use with Meren, the smoother and more consistent your deck will run. I think I'd cut Dash Hopes which seems to better suited for a black aggressive deck since the life loss isn't as important for your opponents when you are trying to combo off (although I can understand if you want to keep it since it is such a sweet card).